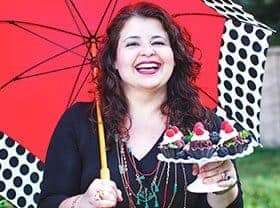 Disclosure: This is a compensated campaign in collaboration with Kikkoman and Latina Bloggers Connect. Herein, all opinions are honest and my own, as always. 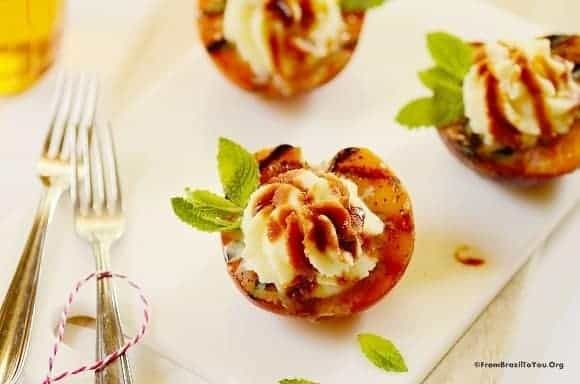 Grilled Peaches with Mascarpone Cream and Teriyaki Sauce is our ultimate summer creation… a make-ahead appetizer prepared using Kikkoman Teriyaki Marinade and Sauce. This is a dish with salty, sweet, and tangy notes as well as crisp and creamy textures. It’s easy and quick to prepare, yet able to impress the most demanding of guests. 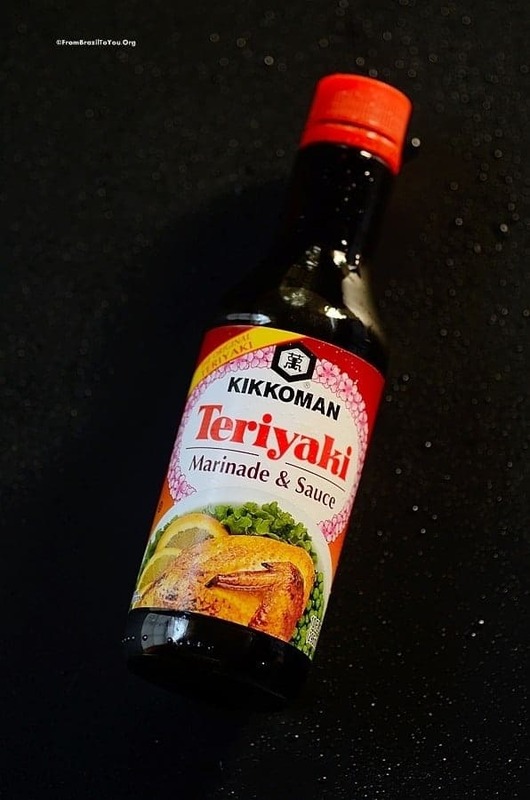 Kikkoman Teriyaki Marinade and Sauce is perfect for our appetizer dish… Starting out as a simple mixture of soy sauce and spices, teriyaki has been popular ever since it was first created in Japan. The lustrous sheen of the sauce inspired the name “teriyaki” (glaze-broiled). Japanese-Americans in Hawaii added fresh ginger, brown sugar, pineapple juice and green onions to produce the teriyaki that we all know and love. … And this is all because Kikkoman Teriyaki Sauce is a versatile ingredient that can be used to prepare many different types of cuisines, not just Asian. Our grilled peaches with marcarpone cream and teriyaki sauce reduction combine both Italian (the combination of fruit and cheese) and Japanese (sauce) elements. These are two cuisines that greatly influenced Southern Brazilian cuisine by virtue of their large-scale immigration to Rio Grande do Sul and São Paulo, respectively. To be faithful to the gaúcho (from Rio Grande do Sul) tradition, I added the grilling factor to our dish. To find out more about Kikkoman products and to get great recipe ideas, click HERE. 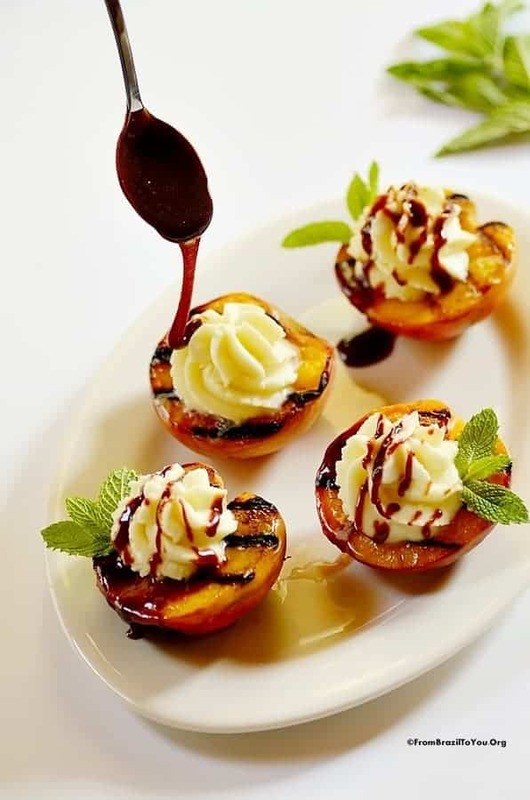 For now, enjoy our grilled peaches with mascarpone cream and teriyaki sauce reduction… and happy grilling! 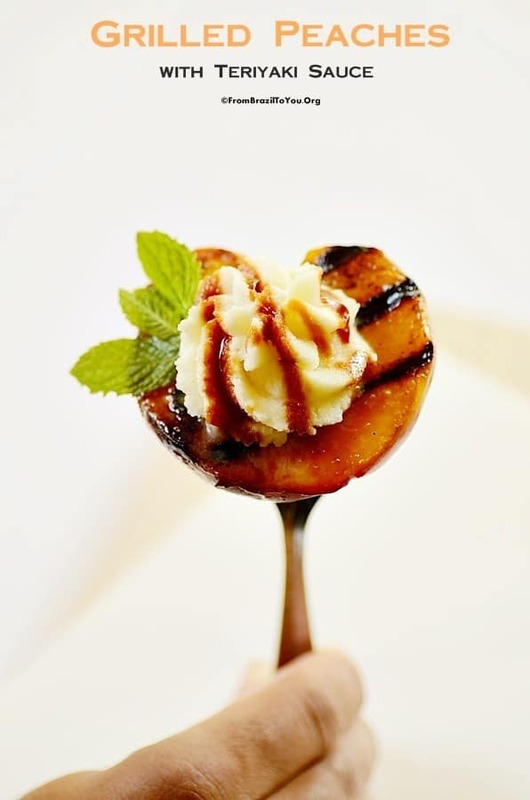 Grilled peaches with mascarpone cream and teriyaki sauce reduction is a quick, make ahead appetizer that combines sweet, salty and tangy notes with crisp and creamy textures. In a small non stick pot, stir in 2/3 cup Kikkoman Teriyaki Marinade and Sauce, 2 tablespoons of juice, and sugar until combined, and then bring to a boil over high heat. Reduce to low and simmer until reduced to about half the amount (about 10-15 minutes). Transfer to a small bowl and let cool to room temperature. This can be prepared ahead of time and refrigerated. While sauce reduction is cooling, prepare the mascarpone cream. Using a stand mixer fitted with the whisk attachment, whisk the mascarpone cheese, honey, 1 Tablespoon of juice, and salt at medium speed for about 30 seconds or until well mixed. Reduce the speed of the mixer to low and slowly pour the heavy cream. Once cream is all added, scrape down the sides of the bowl, and return the mixer to medium speed. Whisk until firm peaks form (about 1 minute). Refrigerate the mascarpone cream. The mascarpone cream can also be prepared ahead of time. To grill the peaches, bring a griddle or grill to medium-low heat. In a small bowl, stir in together olive oil and 1/2 tablespoon of Kikkoman Teriyaki Marinade and Sauce just until combined. Brush each peach half with the oil mixture as well as the griddle surface and place peaches on the heated griddle or grill. 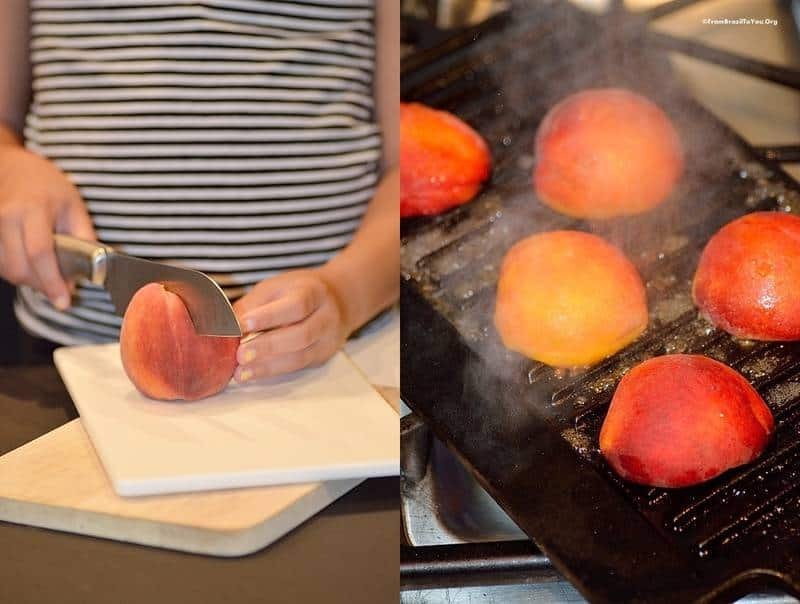 Grill the peach halves until they are slightly softened and have dark grill marks (5-6 minutes). 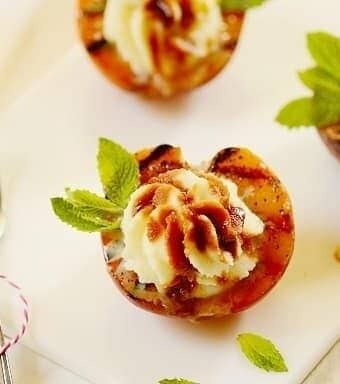 Serve grilled peaches warm or at room temperature, topped with the mascarpone cream and drizzled with the Teriyaki reduction. You can garnish with fresh mint leaves if desired. Piping (instead of simply spooning) the mascarpone mixture is optional although makes it prettier. Both the mascarpone cream and teriyaki sauce reduction can be prepared ahead of time and refrigerated. Just let the reduction come to room temp before using -- or it will be too thick to pour. Fantastic summer recipe Denise! Quick, easy, yet scrumptious with flavor. The pairing of mascarpone with teriyaki sauce is inspired! Wow! Denise…what a gorgeous summer appetizer. I love blending sweet and savory elements. I must admit the teriyaki sauce is a surprise with these peaches. But now I can’t stop thinking about other uses for teriyaki! I wish you were passing that fork through the screen to me! A perfect appetizer to enjoy to enjoy the lovely peaches. I love teriyaki sauce, never used it this way. I’m gonna do this. Can I come live wit chooo?! Holy moly you make the most magical looking foods. This absolutely needs to be a thing. What an unusual combination of flavours. I am so pumped to see/taste for myself. Pinning this gorgeousness for sure. This is a fantastic idea Denise! We never tried grilled peaches before, it’s amazing how many beautiful things you can learn from fellow bloggers! Loved what you added a pinch of salt when you added the honey. This idea is perfect when you’re having a few friends over for a BBQ. Plus, these days peaches are fresh and in abundance, so the timing is also perfect. Mascarpone is one of Mirella’s favorite ingredients so your recipe will be used very soon! I’ve grilled peaches before, but never thought to combine them with Teriyaki sauce. What an inspired idea! Absolutely terrific looking recipe — thanks so much. 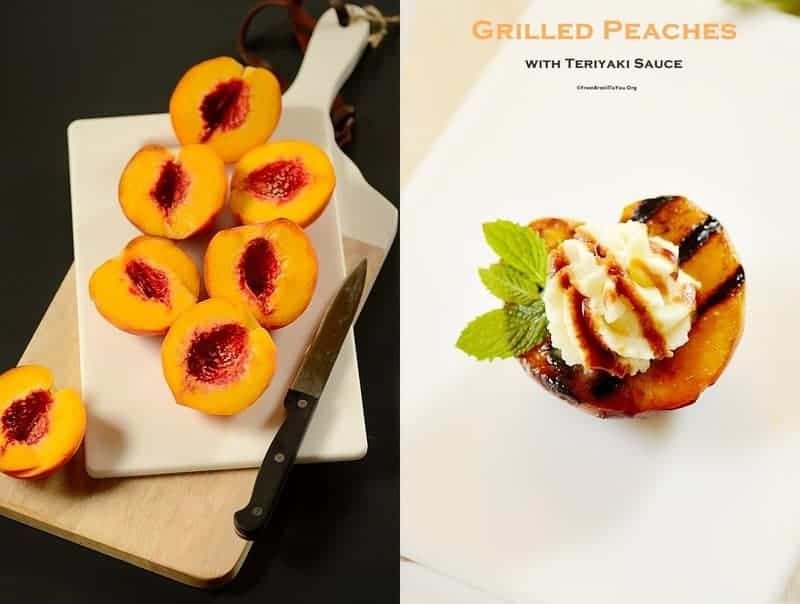 I adore grilled peaches, but never thought to use terriyaki sauce – what a brilliant idea Denise! What an usual flavour combination! I definitely am curious to try it.